A YouTube video of seven-year-old Londoner Emma Coleman singing 'Love is an Open Door' is going viral. 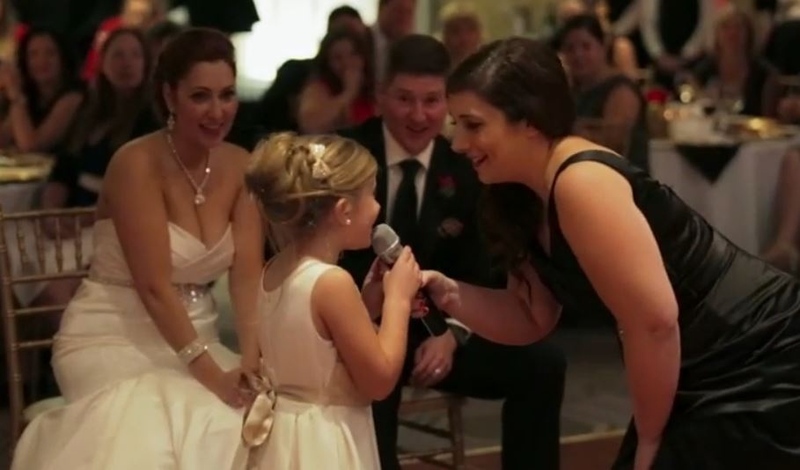 The video, filmed and posted by Mitchell Reilly Productions (MRP) Weddings, shows the flower girl and her mother - a bridesmaid - singing for the bride and groom at their St. Catharines, Ont. wedding. Posted less than a week ago, as of early Monday afternoon the video already had more than a quarter-of-a-million hits. The video has already been shared by numerous media outlets in Canada and the U.S.
And a warning, you're very likely to tear up during this! Seven-year-old Emma Coleman sings 'Love is an Open Door' with her mother is this image taken from YouTube video provided by Mitchell Reilly Productions.